Can (Gomutra) Indian Holy Cow’s urine Really Cure Cancer? will it really Benefit my Health? Urine, be it of any living being, consists of waste products. Cow’s urine as well. The major constituents of cow’s urine are water, urea and minerals. Urea, the chemical from which the word urine is derived, is toxic when in human blood. Drinking urine is safe since urea is not immediately absorbed into the bloodstream. However, precautions such as collecting urine in a sterile container and consuming within 2 minutes of collecting are necessary. Urea is an exceptional antidote for numerous skin diseases. Urine is filtered by kidney so it is sterile in nature and devoid of any harmful bacteria or viruses. It is so safe that it can be used to clean an open wound. Our ancestors had experimented with it’s medicinal qualities and documented the benefits of applying it on cuts, wounds and fish stings. here. It also includes gold salts, one of the notable causes of glowing face exhibited by people who regularly consume Indian cow’s urine or milk. 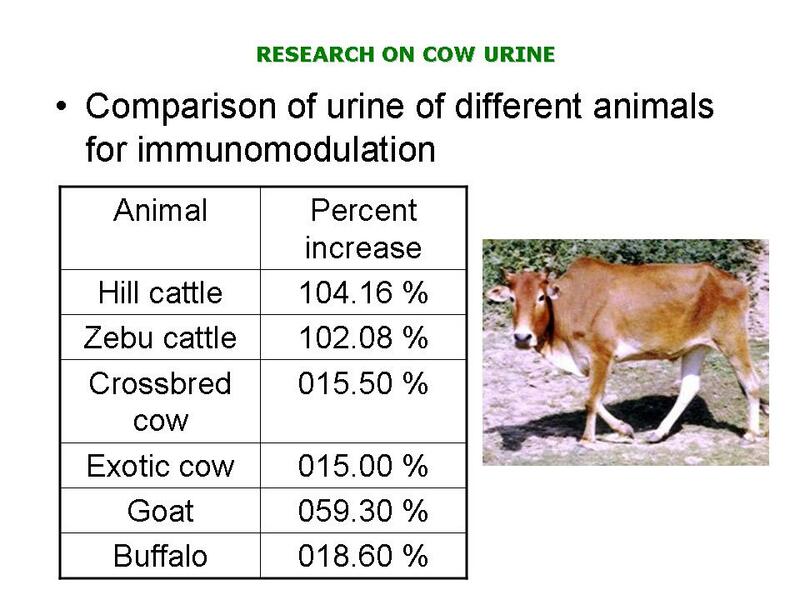 Human and cow urine consist of Urokinase. This is an essential ingredient in some anti-cancer drugs. Drinking cow’s urine once a week will help thwart cancerous cell growth. However it is futile in cases of advanced stages where even modern medicine is lacking in solutions. Gomutra (cow urine) consists of micro organisms like Trichoderma, beauveria bassiana, bacteria subtilis, bacteria thuringiensis, mycorrhiza, metarhizium anisopliae etc. Traces of gold have been found in a wax textured sac adjacent to cow’s liver. Ayurvedic practitioners refer to this organ as Gorochan. It is believed to be a bladder stone / cow stone/ gopitta. Ask any experienced butcher of the bygone era and he will attest to this. It was a well sought after item in Arab countries and by ayurvedic practitioners until a few years ago. There is still an underground demand for this and authentic ones are elusive and invaluable. This organ cannot be found in all cows. It has been observed to be present only in healthy free grazing cows on the Western Ghats and untamed pastures. All living objects are composed of minerals, even humans. Their balance is what differentiates good health from bad health. Gold, copper, mercury and other metals have been used to treat humans and it has been proven very effective. High dosages have also resulted in various side effects common among which is kidney damage. But somehow minerals in cow’s milk and urine are in stable form which don’t seem to harm humans. This is also one of the reason why organic milk is a waste of money in my opinion. Gold protects your body and gives longevity. Gold can tackle all sorts of poison. Organic milk lacks many important aspects and benefits compared to natural milk. Play the the video in the link below and you shall learn the secrets about this bacteria. Hibiscus flower stegman also possesses gold content. That is another reason why people who consume Hibiscus flower regularly exhibit a glowing body. 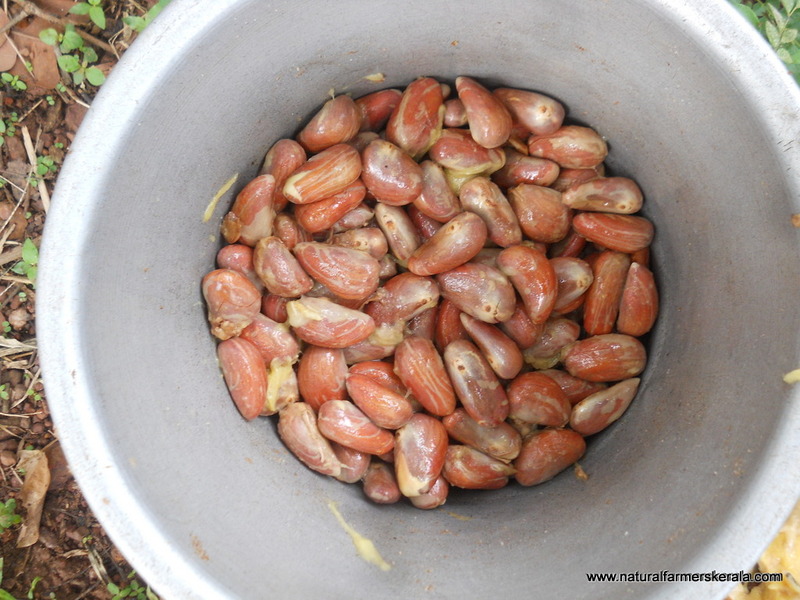 Jack fruit seeds are also loaded with gold content. After cleaning the seeds you can store under normal condition for almost a year, like you would store other grains. Cows Urine is an elixir or Amrit, as we call it in India. People who regularly consume cow’s urine possess radiant and golden complexioned bodies. No type of toxin has any effect on their body. Source – check India section. Gold has the ability to safeguard human body from all kinds of diseases and toxins. Many leading brands of chyawanprash marketed their products as containing authentic silver and gold. Our ancient sages had discovered the amazing effects of these noble minerals on human anatomy and psychology. This is one of the reasons copper and gold vessels were used during ancient times. Gold ornaments like finger rings, nose and ear piercings protect people from illnesses. 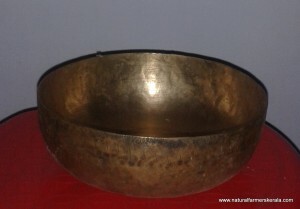 I use a vessel which is a mixture of copper and tin (bronze) which is known as kinnam. Urea also helps in clearing excess mucus buildup in the body. I drink cow’s urine sometimes when I get my cows out from the shed in the morning. A few minutes afterwards my body spits out the excess mucus. Kerala, typical of any tropical land, hosts many viral and bacterial fever during monsoon. My immune system has been in great shape since childhood but when I moved to Kerala I fell ill twice. Fevers in Kerala are notoriously contagious but since I began consuming cow’s urine 2 years ago I have not fallen sick even once. Fresh cow’s urine is considered best. 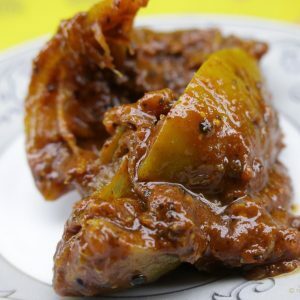 It is not dissimilar to consuming a strong Kashayam. it is pungent with a bitter and acidic aftertaste. However it’s aftereffect is cooling. 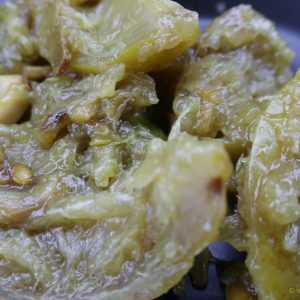 It is like eating Nellika (Amala in hindi) or Indian Gooseberry. It stabilises vata, pitta and kapha. So Amla and Cows urine has similar benefits. Aren’t humans consuming honey which is the saliva of bees mixed with nectar. What about milk which has mucous and other cows enzymes. Are we not consuming entire animals and even the waste producing organs of the same animals. What about eggs? Then why so much fuss about cow’s urine. 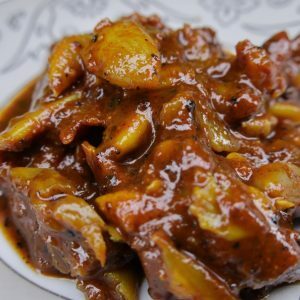 If you have not consumed cow’s urine yet, give it a try you will thank me for it. Only drink urine of cows that are taken out for grazing on untamed pastures and drinks only clean water fit for human consumption. Only such cow’s urine will have medicinal quality. Finally, have patience if you intend to cure any disease. Nothing will work overnight. Yes its true, I have witnessed some cases and even know a person who got completely cured of blood cancer after following Naturopathy. Lucid and very informative. Thank you. One doubt what are Zebu cows? From what I think I know all indian cows are Zebu cows arent they? yes all Indian cows with hump and dewlap are Zebu cows. many thanks for the detailed information,in India many persons believe in the cow’s urine therapy.I think the best is when calf drinks only mother’s milk and not in other feeds such a grass etc. I read with interest about cow urine therapy and about your Vaidhyar. I have a cosin who is suffering from a rare disease called Moyo Moyo where there is no treatment. Can i seek your help? Can you ask your Vaidhyar and naturopath whether there is any treatment for this peculiar disease? You can mail me at rdpgiri@gmail.com. Thanks. can cow urine cure stage 4 colon cancer? 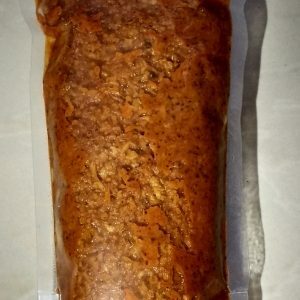 How can I get this in USA? SOrry I am not sure about it. You can try it. Not sure in US if its possible. There is no quick way out of anything. Sorry for delay in reply. was away because of a accident. respected sir,i`m a post graduate student [oral and maxillofacial pathology] doing a study on testing the efficacy of cow urine on oral bacteria.please tell me if you have panchgavya product. Is cow urine is effective or panchgavya is effective? I read with interest about cow urine therapy and about your Vaidhyar. My father is suffering from a Prostate cancer disease, he is facing pains in back. Can i seek your help? Can you ask your Vaidhyar and naturopath whether there is any treatment for this disease? which type of cow urine is good for cancer. well. copper color cows urine is considered good for consumption. how does it preserved as it is ? Whether its quality detorits with time ? Cow urine or any other urine will start deteriorating. There will be chemical reaction and it breaks down. Mostly you will see a oily layer appearance over the urine once it is few days old. My husband has brain cancer (non hogkin primary CNS lymphoma). Can we follow this urine therapy? It has to be taken fresh or can be stored for a day or 2 and den taken? And how much quantity at a time ? It has to be taken daily or weekly once? Sorry to know about your husbands health. Wish he gets well soon. I am sure you would have read on ways of treatment and understanding the whole issues connected with this problem. As far as i know there is blood brain barrier, so no medication reach brain. attached below link has the details. I am not sure on treatment for brain cancer with Urine. However I would suggest you to consult some trained vaidyar. Generally cows urine is very good for immunity I have mentioned my personal experience. Also only take good healthy cows urine which is left in the open for grazing and take only fresh urine 2 to 10 min old. Beyond it is not that ideal. Also sodium mono lauric acid present in mothers milk and coconut milk or good virgin coconut oil is the basis of human immune system. I will soon write on the benefits of pure virgin oil, we call it venda velichenna in Kerala. Also include some organic diet and I also feel skipping meals at night is good switch to good organic fruits. Chemicals like endosulphan (ddt – mixed with grains) destroy peripheral nervous system which is near to brain and spinal cord. There are many factors connected. Try to learn more and implement in day today life. My Son 26 yrs have psoriasis all over in patches and on the forehead and back head on neck lines it is extended. He is 6.2 ft but has 103 kg weight. He gathered weight in last 6 months.He has a fatty liver with raised SGPt ( 216 reduced from 417 ) , SGOT ( 85 reduced from 158) and GGT( 75 reduced from 100). He is on Ayurvedic and homeopathy but no relief from psoriasis, it is spreading. Can Cow Urine Ark help ? Kindly , pld prescribe food restrictions ! Your sons body is not able to eliminate waste from his cerebral fluid- spinal cord (Brain activity waste). I have mentioned in detail about the same in the below post. 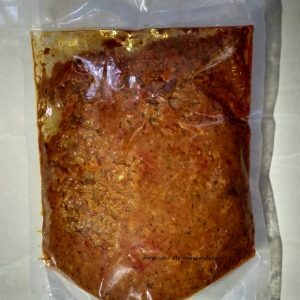 It will be cured 100% by Rambev babas mecicines, Patanjalis medical cetres spread across all towns and cities in India. Sorry to know about your mothers health. Wish she gets well soon. immunity I have mentioned my personal experience. Also only take good healthy cows urine which is left in the open for grazing and take only fresh urine 2 to 10 min old. Beyond it is not that ideal. My First son 4 months old is suffering from Highly Malignant tumor called Rhabdiod tumor ( Cancer) after 4 month treatment including 1 surgery 3 chemo n 5 radiation therapy doctors of AIIMS NEW DELHI failed to cure him. Now he is suffering badly its been spreading very rapidly in his body..can u help my son ? Sir I am 69 years old , was diagnosed with MDS with 5q deletion ( a type of blood cancer ) and I am blood transfution dependent thrice a week and on Dyalisis three times a week . Can go mutra help my condition . Sorry to know about your health. Well i am not sure in your condition you will be ok to take cows urine. Please consult some physician or ayurvedic doc. Also its really difficult to get good quality cows urine. Most indian cows are also kept in filty environment and not left out for grazing. Sir i am having fatty liver and my liver is mildly enlarged so i am very stressed and worried so tell me a remedy to cure this please…. Please take care as mentioned. Liver is a very important organ. Many functions is done by liver. I want help for brain cancer. Sir My sister is suffering with “low grade serous carcinoma” (lgsc) ..one type of ovarian cancer, will cow urine therapy be helpful in not reoccurring of the cancer again. My Father is suffering from throat cancer in Advance stage doctor suggested continous chemotherapy for 6 weeks & given 20 percent chances.As my father got brain stroke before 10 year and having sugar & bp.So went Ayurveda treatment along with we are taking cow urine therapy . How much it will help is my suggestion is correct or not for going Ayurveda treatment plz tell me sir. Sir my father is in 4 stage of mouth cancer and now speed in lungs .and after 3 chemotherapy cycles it didn’t show any improvement so please tell me whether it it will help or not . Dear Gurdit singht, What do you want to know about Indian Cow Ark. Basically, cow ark should be from good healthy Indian cows, distilled cow urine. Please check the source. My father has enlarged prostate of size 5.7×6.1×5.9. His age is 64 . is there any medicine using gomutra that it can be cured. It has a special hospital for cancer & treatment is based on cow’s urine & panchgavya.. many people cure their diseases .hope it is useful for those who r needy even kam a cancer survivor& planning to visit it you can see it on Google also about this hospital.may be same therapy hospital in Kerala or Karnataka also . Today I gargled with cow urine but after spit out the urine, skin peeled off from inner side of cheek, tongue n gums. What is this?? Does it happens with everyone? 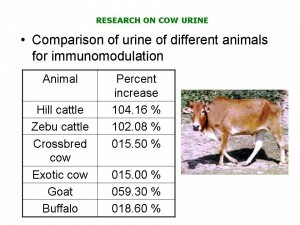 very good information ,cow urine is really very helpful in many diseases . Sir my cousin has breast cancer and she is taking treatment of cow urine therepy.. I just want to ask can she eat white mutton..”chicken, fish and eggs” during this period?